horror maestro, H.P. 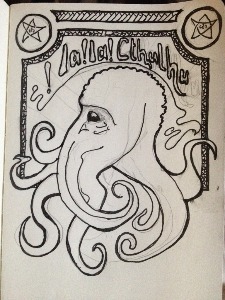 Lovecraft, was preparing his final exit; another year afterward, in 1938, back in the Soviet Union, the theorist, writer, and activist Nikolai Bukharin died at the hands of Stalinist executioners in Moscow after, to say the least, a tainted trial; another three hundred sixty-five days closer to the current context, in 1939, Germany finalized the dismantling of Czechoslovakia, a brief ‘republic’ took shape in Carpatho-Ukraine before Hungary absorbed it, and a boy child cried out who would become the acclaimed British writer and thinker Robert Nye; two more years nearer to now, in 1941, the baby boy opened his eyes who would rise as the crooner and songwriter Mike Love; another seven hundred thirty days onward, in 1943, an infant male entered the world in standard fashion who would grow up as the wild rocker and writer, Sly Stone; four further years toward the present pass, in 1947, another baby boy came along, also destined to perform and write songs, in the guise of the legendary Ry Cooder; sixty-one years back, My Fair Lady had its opening night on Broadway; nine years even more proximate to the present day, in 1965, President Lyndon Johnson intoned, “We Shall Overcome,” while advocating passage of the Voting Rights Act; two decades after that to the day, in 1985, symbolics.com became the first registered Internet domain; half a dozen years farther forward in time, in 1991, the final disposition of Germany’s reunification took effect; seven years more on the path to today, in 1998, the iconic and occasionally controversial ‘Dr. Spock’ took his last breath; fourteen hundred thirty more days thereafter, in 2002, a hideous scandal unfolded as the Wall Street Journal broke a story about insider trading and kickbacks among all but two of the ‘working class’ board members of the United Labor Life Insurance Company, who had stolen millions in real workers’ premiums to line their pockets; nine years past that dark day, in 2011, five thousand miles away in the Levant, imperially orchestrated assault on Syria initiated the still ongoing butchery of civil war in the region.